On November 8, all students who will be taking the English HSA in May took thier first practice test. 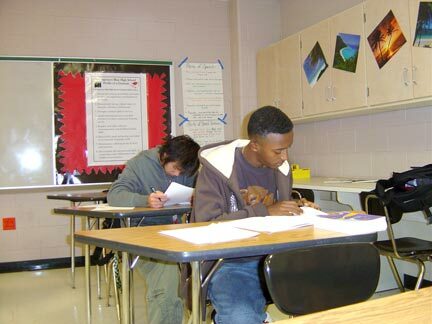 All students who are going to graduate after 2008 have to pass four exams – algebra, government, English 10 and biology. This includes students in ESOL, too, which is making many students worried. Many of the ESOL teachers and students don’t think this is fair. These exams are called High School Assessments (HSA). When ESOL students say that the HSAs are hard it does not mean that the students are lazy or not smart. They are smart just the same as other students. But they don’t have the chances other students have. Being in ESOL means students are learning a new language – a foreign language – that every student in school must know. But students need a lot of English to pass the exams, especially the English exam. Mr. Bellino believes that to help solve this problem, school needs to operate different, especially for ESOL students. “Students need more time to learn the academic courses and also get same of the many other opportunities high schools offer,” he said. Mr. Bellino thinks that schools should have school for the whole year, including summer. He also thinks high school will take more than four years for many students who take ESOL classes. Ms. Zompa, one of Blair’s ESOL teachers who teaches a high level of ESOL, agrees with Mr.Bellino. “ESOL students are developing their language skills and learning content at the same time,” she said. “The test is for native English speaking students, not ESOL students.” Ms. Zompa also believes that the students have ss a difficult English exam created for students who have been speaking English all their lives.”not been learning English long enough to have it as a valid test of their skills.